The beauty of nature cannot be underemphasized or highlighted, the delight and pleasure it gives are simply breathtaking. Are you a lover of waterfalls? If you are, this article is for your consumption as we have carefully put together a list of top 10 beautiful, breathtaking, fascinating waterfalls from different countries all over the world today. Join me as we go down the list. This incredible waterfall can be located in Julia Pfeiffer Burns State Park that flows year-round. It is about 80- foot high (that is 24m). It falls directly into a beach located around a small cove shortly before it runs to the Pacific Ocean. The Salto del Agrio is situated in Caviahue and is about 60 meters high (197 feet) which falls into a little green pool surrounded by yellow and red basaltic rocks. This amazing waterfall is surrounded by the tree called ‘’araucarias’’ which makes it even more fascinating. A group of three stepped falls makes up the Yosemite fall which has its total height at 739 meters (2425 feet) making it the highest measured waterfall in North America. 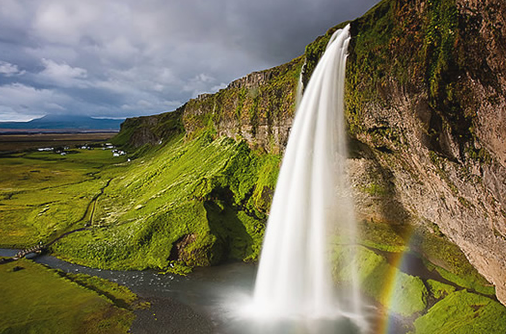 This waterfall is one of the well-known waterfalls of Iceland which has its height at about 40 meters (which is 130 ft) and situated about 18.6 miles from Skogar, between Selfoss and Skogafoss. Significantly it has a footpath at its bottom which lead to the back of the waterfall. This waterfall has a unique feature which is – it can be reached from two different towns which are Foz do Iguacu in Brazil and Puerto Iguazu in Argentina from either side of the waterfall. It also provides amazing view and walkway and its form permits remarkable panoramic Vistas. This is one of the most prominent waterfalls in California Yosemite Valley precisely with white waterfall and prominent force from the edge of the gorge for 188 meters (617 ft). This is another shamming waterfall with 979m (3,212 ft) and a plunge of 807m (2,648 ft). Its name was named after Jimmy Angel – he is an American bush pilot who was first to fly over the fall in the year 1933. This waterfall is situated in Daxin County on the Chinese axis with the coming together of the Detian Falls and Ban Gioc Falls. The fall crosses the border between China and Vietnam and joins with the Banyue waterfall in Vietnam. It happens to be the largest waterfall in Asia. This amazing waterfall which has claimed the second position on our article today is situated in the Southern part of Africa with the above-mentioned African countries. Significantly, it is one of the most famous on earth. The Victoria waterfall has claimed the largest position in terms of width with about 1,708 meters (5,604 ft) and a total height of 108 meters (354 ft). 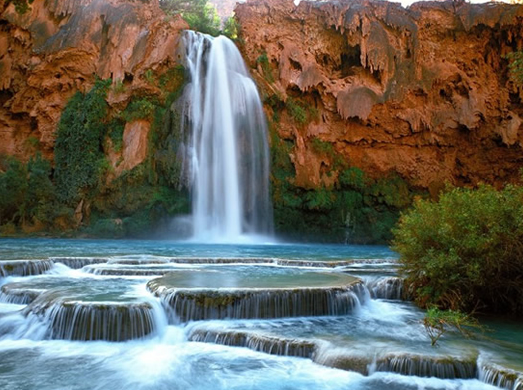 The Havasu falls can be located at the bottom of the Grand Canyon in the Havasupai Indian Reservation. ‘’Havasupai’’ means ‘’people of the blue-green waters’’, From the picture you can see clearly for yourself why it was named ‘’Havasu Fall’’. In addition, it is one of the most photographed waterfalls the world have got.